Although Milan has plenty of sites of historical and cultural interest, it’s best known as a fashion hotspot. 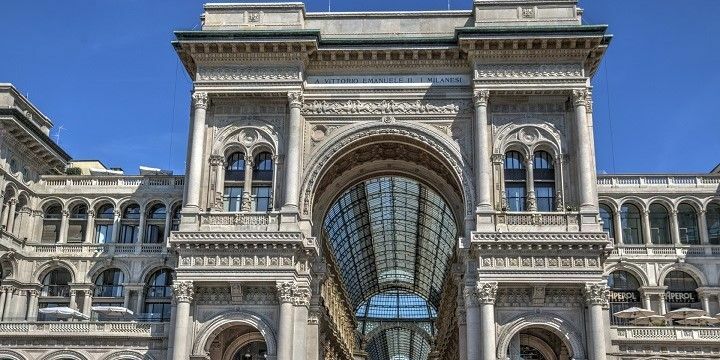 Get a taste of the city’s luxury shops inside the Galleria Vittorio Emanunele II, an impressive shopping mall made from glass and iron. More designer labels can be found in Via Montenapoleone, Via della Spiga, Via Manzoni, and Santa Spirito, often known as the Golden Triangle. The Galleria Vittorio Emanunele II is an impressive shopping mall. There’s much more to do in Milan than shopping! If you’re interested in architecture, visit the Milan Cathedral in the heart of the city. It took more than five centuries to build this gothic-style cathedral, which is home to more statues than any other building in the world. Alternatively, head to the Church of Santa Maria delle Grazie to see Leonardo da Vinci’s famous Last Supper painting. Be sure to plan your visit in advance, as tickets sell out quickly! If you don’t manage to make it into the Church of Santa Maria delle Grazie, don’t worry: Da Vinci’s legacy can also be seen in the ornate interior decoration of the Sforza Castle, which is much more spectacular than its red-brick exterior. Be sure to check out fun-filled areas outside of the city center, such as the design quarter of Brera, the waterways of Navigli, and the nightlife district around Corso Garibaldi and Corso Como. Although the nightlife district isn’t particularly big, you’re bound to find a bar or club for you! The waterways of Navigli are a beautiful spot day and night. Thanks to its central location, Milan is a great starting point for day trips to other major cities, such as Turin, Genoa, Bologna, and Venice, which can all be reached within three hours. If you’re looking for some more natural beauty, head to one of the large nearby lakes, such as Lake Garda and Lake Como to enjoy their beautiful waters and majestic mountains. If NextStop24 helped you to choose your next travel destination, we'd be very grateful if you’d search for your accommodation and things to do in Milan through these links. They're affiliate links, which means that we will receive a small commission for every booking made through them. There are no extra costs for you; you'll simply be helping to keep NextStop24 running. Thanks!